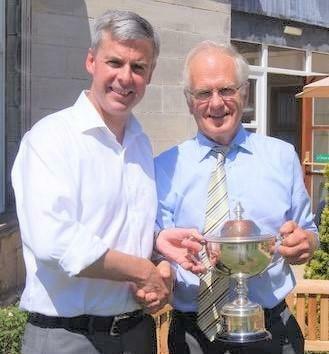 The J.C. Thomson Trophy for Dunfermline Rotary Club’s annual Stableford golf competition had less than 24 hours to dominate the trophy sideboard of Dunfermline lawyer Ralph McCran before having to budge up for a second piece of Rotary silverware….the Alistair Brown Trophy, awarded to the club’s Rotarian of the Year. He received the award on June 28th on the nomination of outgoing president David Lyth, who as one of his last official acts in office, cited the club secretary’s innovative, humorous and faithful support during the 2017-2018 Rotary year. Rotarian McCran, who is a partner in the Dunfermline legal practice of Malcolm, Jack & Matheson, joined the Dunfermline club in 2013 and is continuing in his role as secretary for a further year.